Possibly commissioned by Nicholas Hawksmoor, the drawings of the East Greenwich waterfront in this detail commence with the only known depiction of Thames Cottage, complete with its gazebo. Thames Cottage was leased by Morden College to William Bracegirdle from 1840-1849. 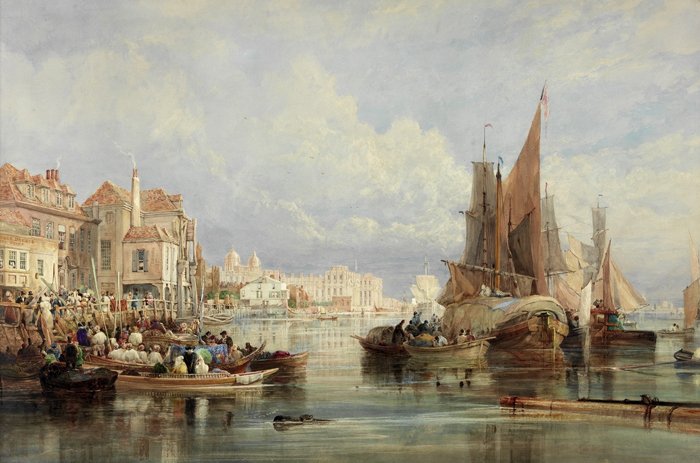 It was demolished and the materials sold at auction in 1854 to make way for the Harbour Master’s Office which was built in 1855. Ambrose Crowley’s large warehouse is shown on the right with, adjacent to it on the left, a building which became The Golden Anchor public house in the 19th century. Ambrose Crowley was a wealthy iron master who established a thriving business on Anchor Iron Wharf. The mansion to the right of the warehouse was originally erected in 1647 by Sir Andrew Cogan. 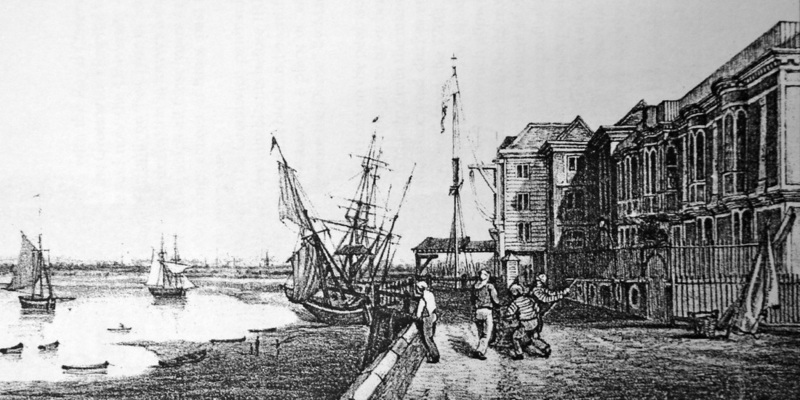 In 1677 it was occupied by George Bouwerman, who held a contract from Charles II to ballast navy ships from Ballast Quay. It was subsequently purchased by Nicholas Cook, who sold it in 1704 to Sir Ambrose Crowley. The building on the right of the mansion is Trinity Hospital, also known as Norfolk College. Founded in 1613 by Henry Howard, Earl of Northampton, it is, in spite of 19th century remodelling, nevertheless still recognisable as the building that exists today. Adjacent to it on the left is the Jacobean mansion acquired by Ambrose Crowley in 1704. 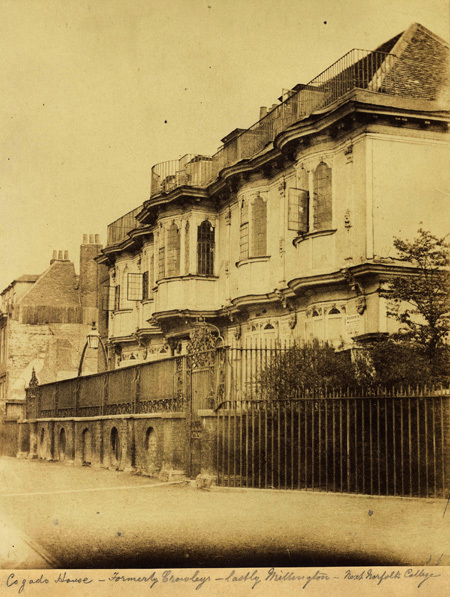 It became known as Crowley House but sadly the house was demolished in May 1855 after failing to find a new buyer, together with the adjacent warehouse, in order to provide stables and grazing for the horses that pulled the trams. The stabling was in turn demolished in 1906 to build the power station to supply electricity to the trams and ultimately the underground trains, which it still does. Sir Ambrose Crowley was a successful and benevolent iron master and a Quaker. His main business, inherited from his father, was in Gateshead, making nails, screws and anchors for the Navy. When he died in 1713 the Navy owed him £50,000. In 1704 he bought a grand mansion, which stood on the site where the present power station was built in 1906. 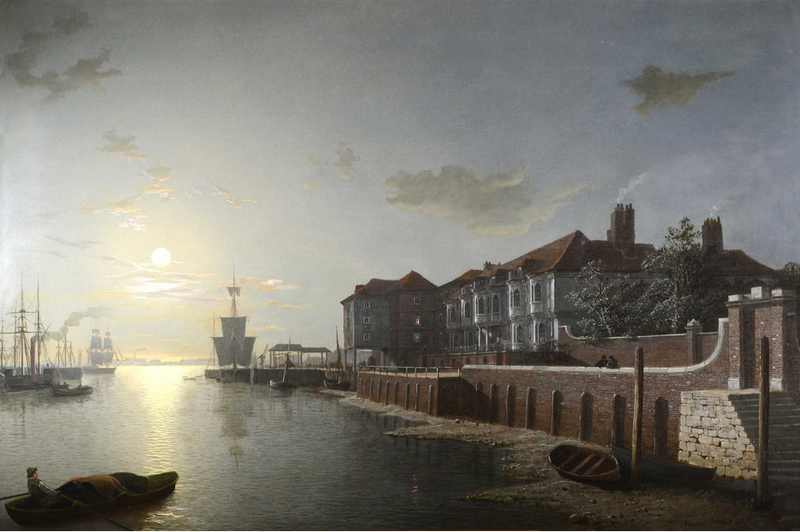 He rented the quay and surrounding land to build extensive warehousing from which he ran his business. 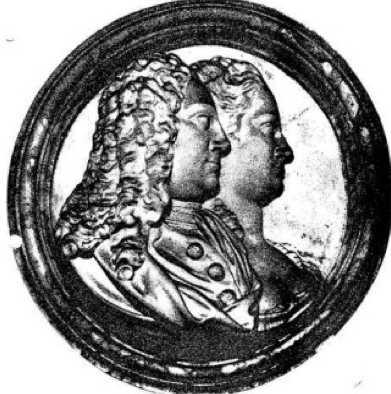 Following his death the business passed to his son John and then to his son’s widow Theodosia, greatly assisted by her late husband’s manager and agent Isaiah Millington, who took over the business. Crowley, Millington & Co. continued in the iron business in Greenwich and Newcastle until the 1850s. The name of Crowley is perpetuated in Crowley’s Wharf, part of the modern Thames Path. View of Crowley House from the east. The tower of Trinity Hospital is visible to the west. In the centre, 3 posts mark the end of Crane Street behind the Crown and Sceptre tavern, now Highbridge Wharf. Pensioners from Greenwich Hospital in blue uniforms are among the figures on the waterfront. They often frequented Crane Street, not only for its public houses, but also for the clay tobacco pipes which were manufactured there. 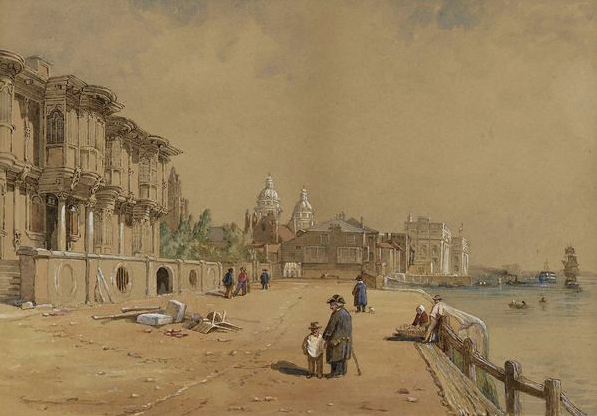 A steamer can be seen leaving Greenwich Pier in the distance. Moonlight scene of Crowley House from the western end of Highbridge Wharf at low tide. The warehouse and Anchor Iron Wharf can be seen in the middle ground, with buildings on Ballast Quay visible in the distance. 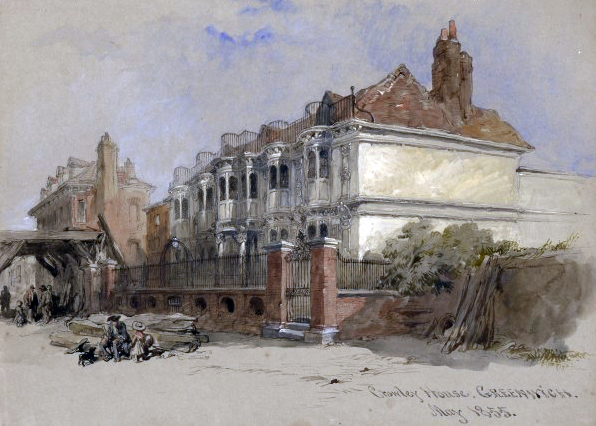 Sir John Gilbert photographed Crowley House for his watercolour painted in May 1855, prior to the demolition of the building. In the photograph the warehouse has already been pulled down but the next house, which is on the 1705 elevation drawings above, is still there. This became the ‘Golden Anchor’ pub but the remainder of the site was demolished to make way for stabling tram horses and ultimately for the power station. After purchasing Crowley House in 1704 Sir Ambrose Crowley built substantial warehousing for his iron business. The scene depicts the embarkation of King George IV on August 10th 1822 for the first visit to Scotland by a reigning monarch since 1650. The Crowley warehouse forms the background to the point of departure with other buildings visible on Highbridge and the Greenwich Hospital beyond. The Golden Anchor public house is illuminated by a shaft of sunlight on the extreme left of the scene.